Chances are, these days many collectors undergo “crossover” experiences with their collecting hobbies. These ‘crossover” experiences are ones where a highly specialized collecting interest such as deltiology intersects with another highly specialized one, such as philately. This has certainly been my personal experience over the past few months. Just the other day, I was extended an invitation to the Brockville/Prescott, Ontario Stamp Club meeting where a “crossover” dealer of both postcards and stamps would be attending. Since I am relatively new to the Brockville area this invitation gives me with a great opportunity to connect with local collectors, feed my passion for postcard collecting and while there, explore the philatelic world more closely with experts in the field. Also, I am in the midst of shifting the focus for my postcard collection so am excited about a new area to explore. 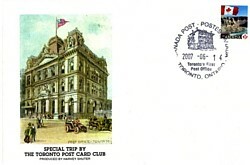 This past June I attended a field trip with the Toronto Postcard Club (TPC) to Toronto’s First Post Office located on Adelaide St. in the downtown area. While the post office dates back to the 1830s, it remains a functioning Canada Post branch today and greatly appreciated by the locals. Following the tour and presentation on the history of the building and post office, TPC member, deltiologist and philatelist, Harvey Shuter gave each of us attending a copy of a postcard that he had designed for the occasion. Keeping philately in mind, Harvey made sure that each postcard received a “Toronto’s First Post Office” cancellation. (See figure 1). Last February at the Toronto Postcard Club’s Annual Postcard Show, I thoroughly enjoyed in-depth “crossover” experiences where I became more sensitized to the intersection of the two collecting worlds of deltiology and philately. As a 15-year veteran postcard collector, “fronts” of the cards or the images have largely directed my postcard purchases. My collection is quite eclectic but predominately focuses on Ontario Hospitals over the years, nurses and nursing, colourful Canadian patriots, Toronto scenes, buildings and events. Occasionally, I’ve had conversations with dealers who drew my attention to the “backs” of the cards and readily shared postal history with me. However, this was never a primary focus for me nor an area that I had really explored before. To tell you the truth, my first exploration was accidental. Dave Moore from Dave and Sandy Moore Antiques & Postcards, Waterloo, Ontario had set aside a few hospital cards for me to peruse since Dave knew of my collecting interests. 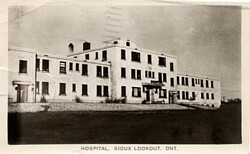 In my little pile of cards, I, not only, found a great photo card of the Sioux Lookout Hospital (See figure 2) which I did not have in my collection, but also, I found interesting postal history of the back. (See figure 3). Two postmarks were present. 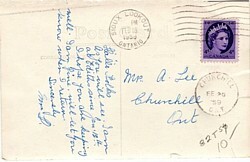 One indicated that the card was sent from Sioux Lookout, Ontario on Feb. 18, 1959 while the other indicated that its arrival in Churchill, Ontario 2 days later on Feb. 20, 1959. Efficient postal service in 1959! My next “crossover” experience was with a fellow TPC member and longstanding member of the North Toronto Philatelic Society – George Sachs. I knew of George’s interest and experience with postal history and was confident that he’d have lots of fascinating information to share with me. By the time I had located him, he had already purchased a few postcards because of the “backs” and he quickly highlighted their postal history for me. 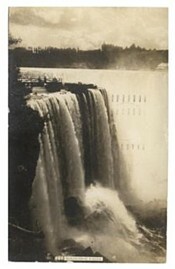 The first postcard had an image on the front of the Horseshoe Falls – an image of little interest to him and a common card reflected by the asking price of $3.00. However, on the “back” was a machine cancellation – only used from July 6, 1908 to October 16, 1912 by post offices in Niagara Falls. It was an International Type 3 machine cancel applied during the last three months of its use. 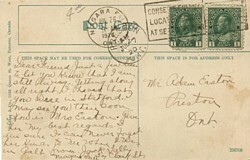 The cancellation was highly readable indicating that the card was posted from Niagara Falls on July 25, 1912 at 2 p.m. To George’s delight, the card also had an intact 1-cent stamp of King George V Admiral issue in excellent condition and well centred. The card was a real photo card published by Fred B. Peck. (See figures 4 & 5). Another postcard showed sending and receiving information not unlike my Sioux Lookout postcard. 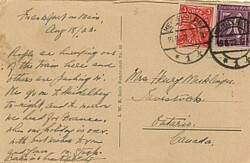 The card was sent from Niagara Falls on July 26, 1920 at 9:00 a.m. and received in Preston, Ontario on July 27, 1920 in the a.m. A pair of one-penny stamps were present although this time the quality of the stamps was less than on the previous card. “Bleeding” of the ink on the stamps was evident indicating wear on the printing dye. However, the stamps were slogan-cancelled with a “Conserve Energy Locate Factory At Seat Of Power” slogan. George came across a number of German-posted cards to add to his collection. One was a German card showing, this time, an image of interest for him – buildings in the city of Berlin before WWI. On the “back” were 2 German inflation stamps posted August 18, 1922 from Heidleberg with clear cancellations. The inflation period was well under way at that time. From July 1922 to June 1923 prices rose by over 18,000%. The card itself was number 66 in the I.W.B. Rembrandt Series. Another postcard was from sent from the town of Glauchau, Germany in 1928 to Kitchener, Ontario following WWI. The address reflected the name change of Berlin, Ontario to Kitchener. One final purchase of the day for George was an early Canadian card sent from Sebringville to Tavistock, Ontario. Posted in 1907, this was a later use of a King Edward VII issue with the stamp being ”reasonably-centred.” (See figure 6). $2.00 for this piece of postal history. So, having tapped the knowledge and experience of a fellow TPC member, I made my way over to a long-time postcard dealer, Ron Feero from Brampton. Similarly, I knew of Ron’s experience, knowledge and expertise in the field of philately. 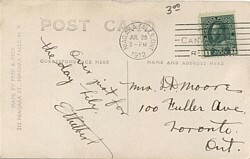 The first postcard that Ron brought to my attention from his stock was one with a railway post office cancellation – Toronto & Niagara indicating it was posted on a train that ran between these 2 destinations. This card was an excellent example of one that truly crosses collecting worlds. It would, not only be of particular interest to train memorabilia collectors, but also to those collectors of railway station post office cancellations. Similarly, postcards with cancellations from small closed post offices are highly collectible by those interested in train memorabilia and/or in postal history itself. Postcards such as a split-ring cancellation from the small closed post office of Perry Siding, B.C. Ron spoke about a great reference book for either postcard or postal history collectors or dealers – Ontario Post Offices compiled by Robert C.Smith and published by BNAPS in 1988. Volume 1 is organized alphabetically and, as such, is invaluable when one is on the hunt for missing information on a particular cancellation or town. That day, Ron introduced me to another great resource – Bob Thorne, a philatelist from Brampton. Bob is the author of Machine Cancellations of Canada, a listing of every machine cancellation known within Canada. Figure #7 shows an example of a machine cancellation including a slogan cancellation advertising the Cobourg Horse Show, August 18-22, 1914. This card would also be a collectible for those interested in advertising. Ron strongly believes that the worlds of deltiology and philately will eventually be more intertwined than exists today – more than the periodic intersecting that I had experienced over this past year. He has seen firsthand how postcard collectors start focusing on the ”fronts” of the cards – perhaps those images of their small home town and then become intrigued by the messages on the “backs”, the cancellations or the stamps – all fascinating pieces of postal history. So, if I may suggest – postcard collectors, join in on a “crossover” experience by turning over those postcard images and see what postal history awaits you. And, those of you well-established in postal history, consider your next “crossover” experience at a postcard show. nformation is available on www.torontopostcardclub.com or tpcannualshow@torontopostcardclub.com.